Judith Steenkamer (1980, Wijchen, the Netherlands) is a fine arts painter of classical realistic portraits and figures. After her childhood, in which drawing was her favorite occupation, she studied philosophy at the university of Nijmegen. She finished her studies and got a job at the same university but the need to develop her artistic skills grew stronger. 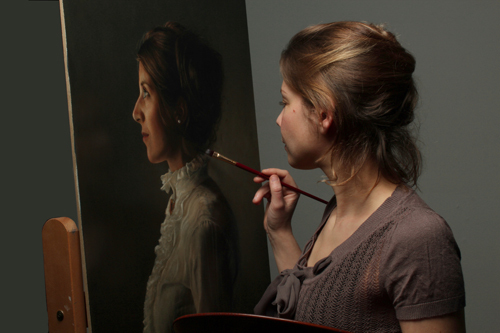 Judith participated in various painting courses but in 2012 she met Dutch fine arts painter Emile van Dalen who taught her his rich painting techniques, based on those used by the 17th century Dutch masters. This allows her to create the paintings she imagined. Strong contrasts in light, serenity in composition and well balanced colours characterize her work. Judith also paints commisioned portraits.